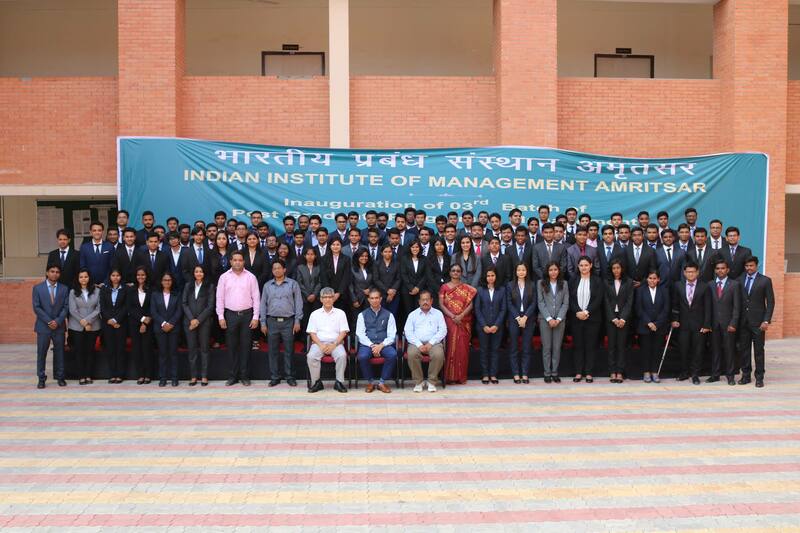 Industry Interaction Cell of IIM Amritsar successfully organized a guest lecture under its flagship series- SpotLight. The industry leader invited to address the students in the SpotLight session was Mr. Naveen Kumar, Vice President, Human Resources at JSW Infrastructure. Mr. Kumar delivered an insightful lecture on “Career Anchors in the Era of Digital Disruption”. The session saw an enthusiastic participation from both the batches- PGP03 and PGP04. In his impeccable career spanning over 24 years, Mr. Kumar has worked across various industries and countries. Mr. Naveen worked with prestigious companies like Nomura, Hewlett Packard (HP), Mascot Systems, Asian Paints and Blowplast Ltd. in various leadership roles. Mr. Naveen is a believer in citizen effort, he is a founding member of IESECCI – a charitable trust dedicated to help Ex Defence Services professionals transition into alternate roles post their retirement. Mr. Naveen began the interactive session by building an instant connect with students reflecting on the nostalgic feeling of returning to a campus and feeling young again. The kind of era we are living in is challenging, exciting and perplexing. The change of era has intimidated us to ponder over the fact that no matter what vocation we opt for, there are certain skills everyone must learn and enhance. He addressed the most crucial question- “What to do with your career and how to start your career?”. Mr. Naveen insisted students to train for the skill sets that are necessary to tackle each situation and develop experience and relationship dynamics that shall come handy in dire circumstances. The stories of Kodak, Nokia, Lehmann Brothers and AIG were quoted to elucidate the meaning of- “Digital Disruption”. He inferred that one should not build a career depending on predetermined choices based on an organisation or brand. The level of indulgence with appliances and social mobility- one needs to sit back and reflect whether is this sustainable or not. We just need to make sure that we have right priorities set for ourselves. Mr. Naveen emphasized that Technology is not what we seek, but how we seek. Positivity, Engagement, Relationships, Meaning and Engagement together make sense. The new relationship of humans and machines is a tough challenge as well as a source of opportunities. Mr. Naveen demonstrated the workforce growth and inferred the boom in the freelance work owing to technological viability. The potential of Internet with its penetration rising from 24% in 2009 to 49% in 2007 has unraveled its role in the number of choices. He reflected that Offline is the new luxury. The more connected we become, the more we must strengthen our social contacts, accountability, ethics and rules. To develop a better understanding about Career Anchors, Mr. Naveen involved the entire audience in an online polling activity by posting questions that required students to choose from the options asked in each of the eight questions that could help them understand their preferences of competencies. The questions were based on the eight career anchor themes identified by Edgar Schein. The Session concluded on a very positive note with Mr. Naveen suggesting individual and organisational strategies for managing organizational socialization.